Now that I'm back in town and Thanksgiving is over I'm back at it! Here is the first of many winter / holiday looks. 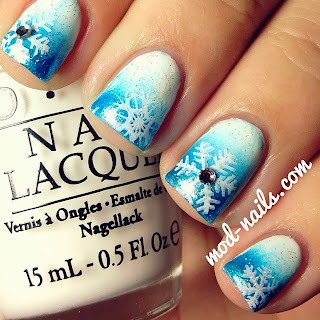 I love this look, it looks so elegant in person and the blue is a perfect winter color! China Glaze's "So Blue Without You"
Make sure to use my code MODNAILS for 10% off at HB Beauty Bar! They will be adding a LOT of OPIs very soon!! !